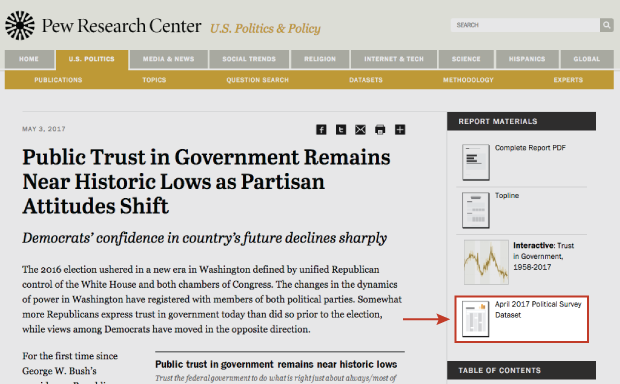 Pew Research Center regularly makes available the full datasets that underlie most of our reports. We typically do not publish the dataset at the same time as the report. The lag time varies by study. That’s because it takes some time for us to complete all reporting for a given study and to prepare the data for public release. Survey datasets are cleaned to make them easier to use and to remove any information that could be used to identify individual respondents. Protecting confidentiality also means that some datasets of rare populations are never released (for instance, surveys of scientists or foreign policy experts). In addition to releasing data from our phone surveys, we also now make available data from our online, nationally representative American Trends Panel (ATP). You can go to this page to see the list of available ATP datasets and the topics that they cover. There are two ways to locate datasets that are available for download. Our Download Datasets page provides links to all datasets that are available from each of our research areas, as well as from our American Trends Panel. Each research area’s page on the Center’s website also includes a “Datasets” or “Data and Resources” tab which provides access to available data, listed in reverse chronological order by when the survey was fielded. When available, those pages also include a list of Pew Research Center publications based on each dataset. 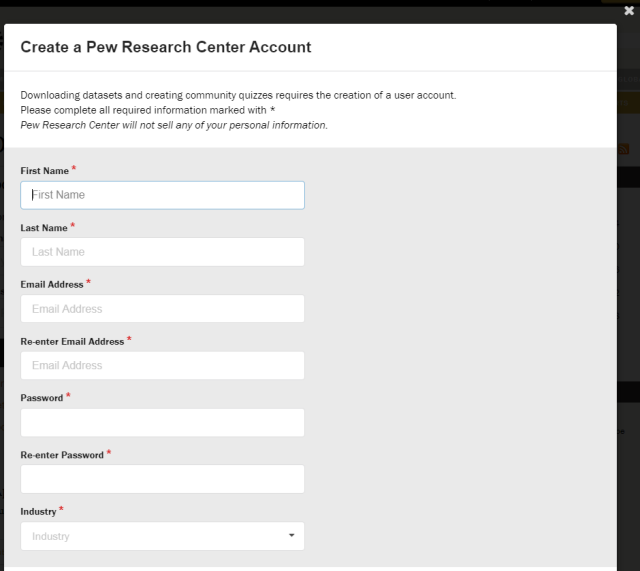 To download datasets, you will need to create a Pew Research Center account (which will require you to fill out a short information sheet) and agree to our Terms & Conditions for using Center data. This account will allow you to download datasets in the future, provide you with easy access to datasets that you have previously downloaded, and allow us to notify you when there is an update or change to the data. After you have signed up, you will not have to complete the information sheet again for future downloads. 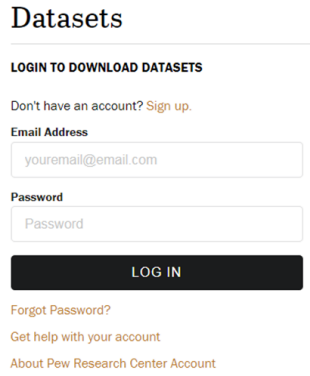 Once you have logged in, click the “Download” button to access the dataset and supporting documents. It is important to note that researchers who want to use Pew Research Center data files need to have experience working with these types of datasets, as well as statistical software such as SPSS, SAS, Stata or R. Most of our files are provided as SPSS .sav files, which can be converted for use with other types of statistical software. A few of our older files are provided as ASCII text files with a fixed layout. These can be read into any appropriate software. SPSS .sav files can be converted into .csv format using R. R is a free, open source program for statistical analysis that can be downloaded from the Comprehensive R Archive Network. The foreign package is part of the standard installation, and can be used to read .sav files into R with the read.spss() function. The data can then either be analyzed in R or saved to a .csv file using the write.csv() function. Included with most datasets available for download is additional material related to the study. A “readme” file is included that describes the data and may include special notes about the data, or syntax for specific variables that are constructed. A full questionnaire provides question wording and ordering for the study and can be used as a codebook. In the case of ASCII datasets, the questionnaire and/or readme provide layout instructions. Most dataset releases also include a topline and a full methodology statement. 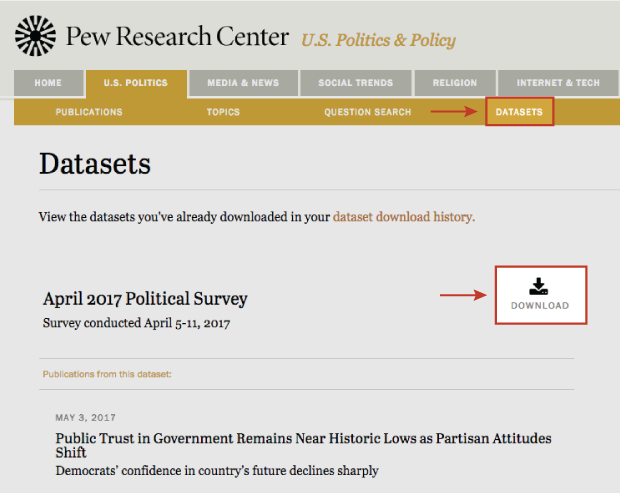 For questions about how to download datasets, you can contact us at info@pewresearch.org.